Now known as Harvey, Heat Press is loving life as a retired racehorse and successful event horse in Michigan. 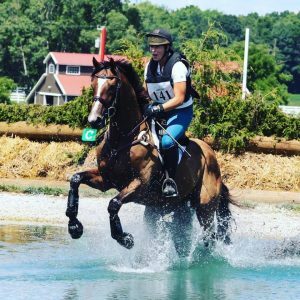 People may remember him from his time as a Sagamore race horse and for winning the Eventing division at the Thoroughbred Makeover last fall. They are competing at Notice in their next event! Photo courtesy of Lindsay, his loving new owner and rider. 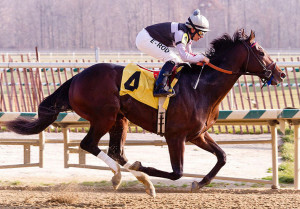 Heat Press by Malibu Moon out of Princess Birdeye placed in the Federico Tesio Stakes at Pimlico in 2013. He also ran in the James W. Murphy Stakes at Pimlico and the Barbaro Stakes at Delaware Park. Many often wonder what becomes of racehorses after they retire from the sport. Groups like the Retired Racehorse Training Project (RRTP) aim to increase demand for retired Thoroughbred racehorses and build the bridges to second careers. This past weekend, former Sagamore Racing colt and current RRTP participant, Heat Press, had the opportunity to show off his new skill set.